including the first color television. John Logie Baird FRSE (August 14, 1888 - June 14, 1946) was a Scottish scientist, engineer, innovator, and inventor of the world's first television; the first publicly demonstrated color television system; and the first purely electronic color television picture tube. Baird's early technological successes and his role in the practical introduction of broadcast television for home entertainment earned him a prominent place in not only in the development of television but as one of the great Scottish scientists in history. Baird's work was part of the great advance in technology that occurred during the twentieth century. Television is one of the technologies that has brought humankind closer, making possible the exchange of information (both sight and sound) about cultures and events to people throughout the world. Even Baird's conversion to agnosticism while living at home does not appear to have stimulated a rebuke from the Reverend John Baird. Moreover, Baird was freely allowed to try to persuade others—including visiting clergy—to his beliefs. Baird was educated at Larchfield Academy (now part of Lomond School) in Helensburgh; the Glasgow and West of Scotland Technical College (which later became the University of Strathclyde); and the University of Glasgow. His degree course was interrupted by World War I. Baird neither drank nor smoked as a young man, having suffered a near-fatal illness as an infant and had a "weak constitution." Due to his ill-health he was not accepted for military service. He worked Clyde Valley Electrical Power Company for a while and then started a variety of his own small businesses. The most successful was manufacturing and marketing a water-absorbent sock. Less successful was a jam factory in Trinidad. He had moved there in 1919 and noting the abundance of citrus fruit and sugar on the island decided to manufacture jam. Unfortunately, the local insect population interfered with the production to such an extent that he returned to Britain within a year. In early 1923, and in poor health, Baird moved to 21 Linton Crescent, Hastings, on the south coast of England and later rented a workshop in Queen's Arcade in the town. Baird built what was to become the world's first working television set using items including an old hatbox and a pair of scissors, some darning needles, a few bicycle light lenses, a used tea chest, and sealing wax and glue that he purchased. In February 1924, he demonstrated to the Radio Times that a semi-mechanical analogue television system was possible by transmitting moving silhouette images. In July of the same year, he received a 1000-volt electric shock, but survived with only a burnt hand. His landlord, Mr Tree, asked him to quit his workshop and he moved to upstairs rooms in Soho, London, where he made a technical breakthrough. Baird gave the first public demonstration of moving silhouette images by television at Selfridges department store in London in a three-week series of demonstrations beginning on March 25, 1925. Soon after, he founded the Baird Television Development Company Ltd.
Baird visited the United States in late 1931. He and Baird Television company secretary, Walter Knight, sailed into New York on the Cunard Line ocean liner the RMS ''Aquitania'' in September. Several months prior to this trip, Baird had met Margaret Albu, a concert pianist from South Africa. Although there was a 19-year age difference they fell in love and while in New York Baird proposed marriage to her. They were married in New York on November 13, 1931. The marriage was a happy one, lasting until Baird's death 15 years later. Baird and his new wife returned to England where they lived in Sydenham, in the outskirts of London. They had two children, Diana and Malcolm. Baird had a private laboratory next to their house. The outbreak of war in 1939 halted television broadcasting, which forced his company Baird Television into bankruptcy. Baird and his family left London for the safety of Cornwall, where he continued his research on television at his own expense. Baird died in Bexhill on June 14, 1946. He was buried in the Baird family grave in Helensburgh Cemetery. Baird is known as the inventor of the world's first television. In fact, the development of television was the result of work by many inventors. Among them, Baird was a prominent pioneer and made major advances in the field. Particularly in Britain, many historians credit Baird with being the first to produce a live, moving, greyscale television image from reflected light. In his first attempts to develop a working television system, Baird experimented with the Nipkow disk, a scanning disc system invented by Paul Nipkow in 1884. Television historian Albert Abramson calls Nipkow's patent "the master television patent". Arthur Korn had previously built the first successful signal-conditioning circuits for image transmission between 1902 and 1907. His compensation circuit allowed him to send still pictures by telephone or wireless between countries and even over oceans, while his circuit operated without benefit of electronic amplification. Baird was the direct beneficiary of Korn's research and success. In his laboratory on October 2, 1925, Baird successfully transmitted the first television picture with a greyscale image: the head of a ventriloquist's dummy nicknamed "Stooky Bill" in a 30-line vertically scanned image, at five pictures per second. Baird went downstairs and fetched an office worker, 20-year-old William Edward Taynton, to see what a human face would look like, and Taynton became the first person to be televised in a full tonal range. Looking for publicity, Baird visited the Daily Express newspaper to promote his invention. The news editor was terrified: he was quoted by one of his staff as saying: "For God's sake, go down to reception and get rid of a lunatic who's down there. He says he's got a machine for seeing by wireless! Watch him—he may have a razor on him." On January 26, 1926, Baird repeated the transmission for members of the Royal Institution and a reporter from The Times in his laboratory at 22 Frith Street in the Soho district of London. By this time, he had improved the scan rate to 12.5 pictures per second. It was the first demonstration of a television system that could broadcast live moving images with tone graduation. He demonstrated the world's first color transmission on July 3, 1928, using scanning discs at the transmitting and receiving ends with three spirals of apertures, each spiral with a filter of a different primary color; and three light sources at the receiving end, with a commutator to alternate their illumination. That same year he also demonstrated stereoscopic television. Baird then set up the Baird Television Development Company Ltd, which in 1928 made the first transatlantic television transmission, from London to Hartsdale, New York, and the first television program for the BBC. In November 1929, Baird and Bernard Natan established France's first television company, Télévision-Baird-Natan. He televised the first live transmission of the Epsom Derby in 1931. He demonstrated a theatre television system, with a screen two feet by five feet (60 cm by 150 cm), in 1930 at the London Coliseum, Berlin, Paris, and Stockholm. By 1939 he had improved his theatre projection system to televise a boxing match on a screen 15 ft (4.6 m) by 12 ft (3.7 m). In 1932, Baird was the first person in Britain to demonstrate ultra-short wave transmission. (Today, we refer to "ultra short waves" as the VHF band.) However, contrary to some reports, these transmissions were far from the first VHF telecasts. In 1931, the US Federal Radio Commission allocated VHF television bands. From 1931 to 1933, station W9XD in Milwaukee, Wisconsin, transmitted some of the first VHF television signals. The station's 45-line, triply interlaced pictures used the U.A. Sanabria television technology. From 1929 to 1932, the BBC transmitters were used to broadcast television programs using the 30-line Baird system, and from 1932 to 1935, the BBC also produced the programs in their own studio at 16 Portland Place. On November 3, 1936, from Alexandra Palace located on the high ground of the north London ridge, the BBC began alternating Baird 240-line transmissions with EMI's electronic scanning system which had recently been improved to 405 lines after a merger with Marconi. The Baird system at the time involved an intermediate film process, where footage was shot on cinefilm which was rapidly developed and scanned. The trial was due to last 6 months but the BBC ceased broadcasts with the Baird system in February 1937, due in part to a disastrous fire in the Baird facilities at Crystal Palace. It was becoming apparent to the BBC that the Baird system would ultimately fail due in large part to the lack of mobility of the Baird system's cameras, with their developer tanks, hoses, and cables. Baird's television systems were replaced by the electronic television system developed by the newly formed company EMI-Marconi under Isaac Shoenberg, which had access to patents developed by Vladimir Zworykin and RCA. Similarly, Philo T. Farnsworth's electronic "Image Dissector" camera was available to Baird's company via a patent-sharing agreement. However, the Image Dissector camera was found to be lacking in light sensitivity, requiring excessive levels of illumination. Baird used the Farnsworth tubes instead to scan cinefilm, in which capacity they proved serviceable though prone to dropouts and other problems. Farnsworth himself came to London to Baird's Crystal Palace laboratories in 1936, but was unable to fully solve the problem; the fire that burned Crystal Palace to the ground later that year further hampered the Baird company's ability to compete. Baird made many contributions to the field of electronic television after mechanical systems had taken a back seat. In 1939, he showed color television using a cathode ray tube in front of which revolved a disc fitted with color filters, a method taken up by CBS and RCA in the United States. In 1941, he patented and demonstrated a system of three-dimensional television at a definition of 500 lines. On August 16, 1944, he gave the world's first demonstration of a fully electronic color television display. His 600-line color system used triple interlacing, using six scans to build each picture. In 1943, the Hankey Committee was appointed to oversee the resumption of television broadcasts after the war. Baird persuaded them to make plans to adopt his proposed 1000-line Telechrome electronic color system as the new post-war broadcast standard. The picture quality on this system would have been comparable to today's HDTV (High Definition Television). The Hankey Committee's plan lost all momentum partly due to the challenges of postwar reconstruction. The monochrome 405-line standard remained in place until 1985 in some areas, and it was three decades until the introduction of the 625-line system in 1964 and (PAL) color in 1967. A demonstration of large screen three-dimensional television by the BBC was reported in March 2008, over 60 years after Baird's demonstration. Baird was a talented innovator and his inventions spanned a much broader range than just television. Several of his early inventions were less than successful, however. In his twenties he tried to create diamonds by heating graphite and shorted out Glasgow's electricity supply. Later Baird invented a glass razor which was rust-resistant, but shattered. Inspired by pneumatic tires he attempted to make pneumatic shoes, but his prototype contained semi-inflated balloons which burst. He also invented a thermal undersock (the Baird undersock), which was moderately successful. Baird suffered from cold feet, and after a number of trials, he found that an extra layer of cotton inside the sock provided warmth. Baird's numerous other developments demonstrated his talent. He was a visionary and began to dabble with electricity. In 1928, he developed an early video recording device, which he dubbed Phonovision. The system consisted of a large Nipkow disk attached by a mechanical linkage to a conventional 78-rpm record-cutting lathe. The result was a disc that could record and play back a 30-line video signal. Technical difficulties with the system prevented its further development, but some of the original phonodiscs have been preserved, and have since been restored by Donald McLean, a Scottish electrical engineer. He also achieved significant developments in fibre-optics, radio direction finding, and infrared night viewing. There is uncertainty about his contribution to the development of radar, for his wartime defense projects were not officially acknowledged by the UK government. According to Malcolm Baird, his son, in 1926 Baird filed a patent for a device that formed images from reflected radio waves, a device remarkably similar to radar, and that he was in correspondence with the British government at the time. According to some experts, Baird's "noctovision" is not radar. Unlike radar (except Doppler radar), Noctovision is incapable of determining the distance to the scanned subject. Noctovision also cannot determine the coordinates of the subject in three-dimensional space. Baird is known, particularly in Britain, as the inventor of television, being the first to produce a live, black and white television image. The "Baird" name for television continues to be used by the Brighthouse retail chain in the UK as a brand name for its televisions. In 2002, Baird was ranked number 44 in the BBC's list of the "100 Greatest Britons" following a UK-wide vote. In 2006, Logie Baird was also named as one of the 10 greatest Scottish scientists in history, having been listed second in the National Library of Scotland's 'Scottish Science Hall of Fame,' behind James Clerk Maxwell and ahead of Alexander Graham Bell. Australian television's Logie Awards were named in honor of John Logie Baird's contribution to the invention of the television. 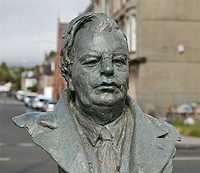 A bust of Baird stands on The Promenade in Helensburgh. There is a memorial window dedicated to Baird, at West Kirk (West Church), Colquhoun Square, Helensburgh. Despite his limited experience with alcohol, there are several pub/restaurants that bear his name: The John Baird in Muswell Hill, North London, The John Logie Baird in Hastings, and The Logie Baird in Helensburgh. Baird's last home in Bexhill was divided and named "Baird Court," with a commemorative bronze plaque placed on the wall. However, despite public objections, it was demolished in August 2007. A new apartment building on the same site carries a historic plaque as well as the name "Baird Court." ↑ Russell W. Burns, John Logie Baird, Television Pioneer (London: The Institution of Engineering and Technology, 2000, ISBN 978-0852967973), 1. ↑ Burns, John Logie Baird, 10. ↑ 3.0 3.1 Malcolm Baird, Down the pub with John Logie Baird? Baird Television. Retrieved October 3, 2013. ↑ 4.0 4.1 John Logie Baird (1888-1946) Scottish Science Hall of Fame, 2009. Retrieved August 26, 2016. ↑ 5.0 5.1 Anthony Fellow, American Media History (Cengage Learning, 2012, ISBN 978-1111348120), 278. ↑ Malcolm Baird, Baird in America Baird Television. Retrieved October 3, 2013. ↑ 7.0 7.1 7.2 Malcolm Baird, John Logie Baird - the final months 1945-46 Baird Television. Retrieved October 3, 2013. ↑ 8.0 8.1 John Logie Baird Find A Grave. Retrieved October 3, 2013. ↑ John Logie Baird (1888 - 1946) BBC History. Retrieved October 3, 2013. ↑ 10.0 10.1 Albert Abramson, The History of Television, 1880 to 1941, (McFarland, 2003, ISBN 978-0786412204), 13-15. ↑ T. Thorne Baker, Wireless Pictures and Television (London: Constable & Company, 1926), 28, 29, 81. ↑ Burns, John Logie Baird, 33-34. ↑ Russell W. Burns, Television: An International History of the Formative Years (The Institution of Engineering and Technology, 1999, ISBN 978-0852969144), 264. ↑ Donald F. McLean, Restoring Baird's Image (The Institution of Engineering and Technology, 2001, ISBN 978-0852967959), 37. ↑ John Logie Baird : 1888 - 1946 "Who invented the television? How people reacted to John Logie Baird's creation 90 years ago" The Telegraph. Retrieved August 26, 2016. ↑ Antony Kamm and Malcolm Baird, John Logie Baird: A Life (Edinburgh: National Museums of Scotland Publishing, 2006, ISBN 978-1901663761), 69. ↑ United States Patent 1,925,554 USPTO, September 5, 1933. Retrieved October 3, 2013. ↑ R.F. Tiltman, How "Stereoscopic" Television is Shown, Radio News, November 1928. Retrieved October 3, 2013. ↑ Interview with Paul Lyons, Historian and Control and Information Officer at Glasgow Central Station, January 19, 2009. Retrieved October 3, 2013. ↑ Abramson, The History of Television, 99-101. ↑ J.L. Baird, Television in 1932 BBC Annual Report, 1933. Retrieved October 3, 2013. ↑ "Baird Television Limited - Growing Demand For Home Receivers - Success Of Large Screen Projections In Cinemas - etc." The Times, April 3, 1939, p23 column A. ↑ Joseph H. Udelson, The Great Television Race: A History of the American Television Industry 1925 - 1941 (University of Alabama Press, 1982, ISBN 978-0817300821), 42, 73. ↑ 24.0 24.1 Kamm and Baird, John Logie Baird: A Life, 286-289. ↑ The World's First High Definition Colour Television System. Baird Television. Retrieved October 3, 2013. ↑ The Dawn of TV D.F. McLean 2013. Retrieved October 3, 2013. ↑ Malcolm Baird, What did John Logie Baird really do in World War II? Baird Television. Retrieved October 4, 2013. ↑ Burns, John Logie Baird, 119. ↑ BBC – 100 great British heroes BBC News, August 21, 2002. Retrieved October 3, 2013. History of "John Logie Baird"
This page was last modified on 18 May 2018, at 20:01.